How Can I Go Charlie's K-9 Camp? Where is Charlie's K-9 Camp in Clemmons on the Map? Absolutely a "dog knowledgeable" staff!! Charlie and his staff love dogs and it shows in everything they do!! Best Kennel around, you will not be disappointed!! I have tried every dog-boarding service in the area, and this is the best! Affordable, quality, friendly service. They will take even the most difficult dog and are equipped to handle any situation. I love the discounts on long stays, and the gift baggie of treats to take home is a nice touch! I recommend them to all my friends. They made me feel comfortable to leave my dog, while away on vacation. They took the time to answer all of my questions. When I picked up my dog she was tired, happy, and clean. I would use them again and again. Always take my dog here when I go out of town. Can't beat the price and I feel I can trust them more than most kennels. I had to leave her here onetime when she had a hurt paw and they even re-bandaged it for me when the old one came off. I rarely write reviews, but had to! we love this place! 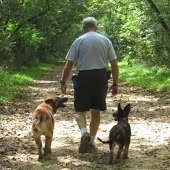 They take great care of our dogs, the staff is wonderful and the rates cant be beat. Also, the gift bag they give is a nice touch.